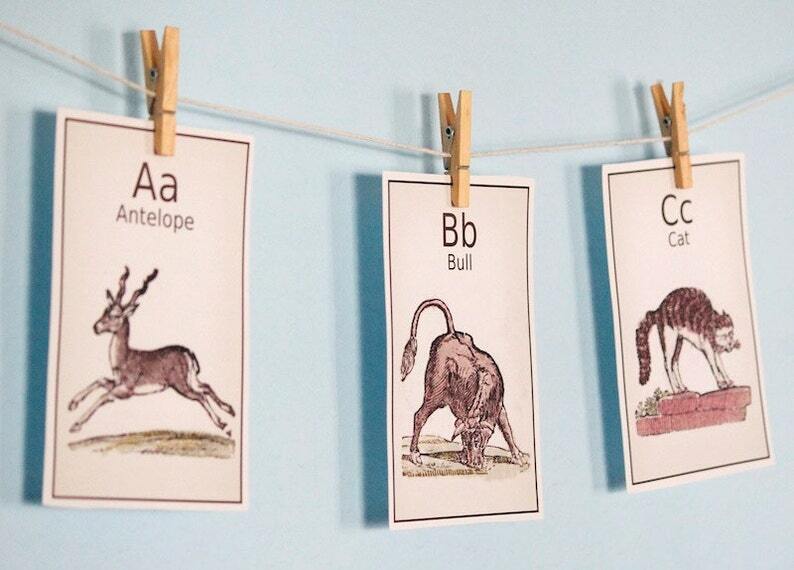 Spruce up your kids bedroom or your classroom walls with these 4 X 6 printable alphabet prints. With 26 prints, one for each letter, how you use them is up to you! Hang them from a string with clothespins, frame them, spell your child's name, or use them as birthday invitations or birth announcements! The letters and their animals are fun! You will receive: A-antelope, B-bull, C-cat, D-dog, E-eagle, F-fox, G-goat, H-hawk, I-ibex, J-jackal, K-kangaroo, L-lynx, M-monkey, N-nylghau (yes, that is right..it is a large bluish Indian antelope! ), O-owl, P-pig, Q-quail, R-raccoon, S-snipe (the bird! ), T-turtle, U-urus, V-vulture, W-walrus, X-xantis, Y-yelper, Z-zebra. All vintage. All restored from a collection of out of print books. Fun for you and your kids. This set come with all 26 letters, size 4" X 6". You will receive a PDF file INSTANTLY from Etsy upon receipt of payment! These cards are intended for home use only. If you want to use them for your business or any commercial use, convo me for information about an extended use license.